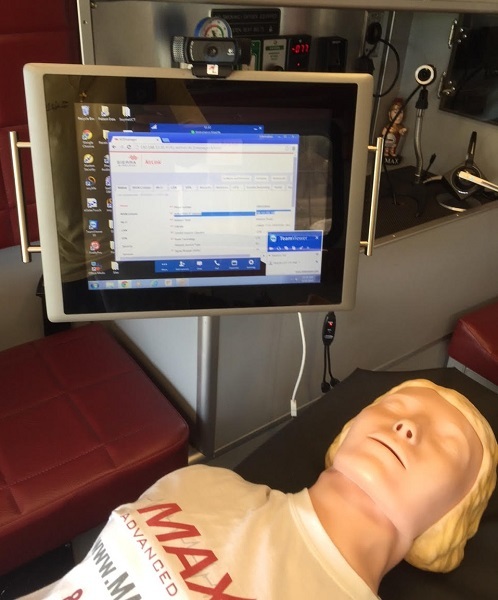 Maximus Security (www.maximussecurity.com) is using the Cincoze DS-1001, along with the CV-100C-M10001 touch screen monitor, in their revolutionary MaxLife™ Telemedicine application. MaxLife™ is the latest in advanced mobile ambulatory telemedicine technology. Originally designed for pediatric/neonatal emergency transportation, this sophisticated, yet simple to use system provides medical professionals live patient access using a high definition IP camera and a touch screen interfaced CPU. When an emergency call is initiated from an ambulance or hospital, the cameras are activated and can be viewed live to help assist paramedics and emergency physicians in treating patients in critical need of lifesaving procedures. The MaxLife™ system allows real-time audio and video, as well as simultaneous recording of every moment. Completely HIPAA compliant and providing the highest level (AES256) of security in the public domain, Max Life™ will remain connected even in the most rural areas as it can function properly on as low as a 2G signal all the way through 4G LTE service. Learn more. Our Powering Innovation feature highlights clients who are using Logic Supply hardware to build the future of intelligent systems. Have a project featuring our hardware that you’d like us to feature? Send the details of your project and a photo of the system in use to marketing@logicsupply.com with the subject line “Powering Innovation”. Windows Embedded is Dead. Long Live Windows IoT?